The Collective Security Treaty Organization is discussing with Bishkek ways to stabilize the situation in Kyrgyzstan. “Russia should think twice before it does that,” he stresses. Mikhail Margelov, from the Russian Federation Council, believes the current crisis will test the organization's pledge to ensure stability and security in Central Asia. 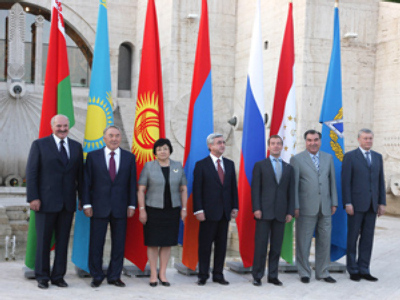 “The situation in Kyrgyzstan is a serious test for the CSTO. It's a test for durability and political decisiveness. Much will depend on the next Security Council meeting, which will determine whether an extraordinary CSTO summit will be convened. What matters most is that nobody can solve Kyrgyzstan's problems for its people. I personally wouldn't like to see Russian troops in another country,” he told RT. “It’s very important to Russia that if there be intervention it will be seen and understood as collective intervention within that framework,” James Sherr, head of the Russia and Eurasia program at the Chatham House think tank, told RT. He explained that one of the major factors that account for Russia’s action in the region is the desire to establish the CSTO as the Eurasian equivalent of NATO. “Russia has quite wisely, in my view, not been eager to intervene in the situation. But if it does continue to stabilize then within the CSTO framework I would not be surprised if you see a peace stabilization or humanitarian force going in,” concludes Mr Sherr.